It’s rare to find a net net stock with such high profit potential. Clarius is one of my favorite stocks. I originally brought it up on the Net Net Hunter forum in early 2014 when it was trading for a $0.19AUD. Since then the stock has climbed over 40%. It’s still a fantastic opportunity though, which is why I suggested that everyone who signed up for the free net net stock ideas take a closer look. It’s also why I’m writing about it here. As you’re about to see, Clarius is one of those rare net nets that provide investors with tremendous upside potential and reasonable safety. Clarius Group is an Australian recruitment agency (ie. “head-hunter”) primarily operating in Australia, New Zealand, and China. The firm mostly recruits for permanent and contract management/professional positions. Clarius is a roll up company. The business has been operating for well over 20 years and has seen significant growth during that time due to its habit of serial acquisition. The firm stacked a large number of businesses together under its corporate umbrella throughout the 1990’s and 2000’s. It now operates as a house of brands, with each acquired organization specializing within a specific niche. Clarius currently has 290 staff working in 38 offices. One thing that you might know about the recruitment industry is that it’s a cyclical business. When the economy is picking up steam, hiring increases and so does demand for recruitment firms. Conversely, when the economy slows down, or business sentiment shrinks, hiring dries up and there’s far less work for recruitment companies. For whatever reason, Clarius’ management team must have not known that. Throughout the mid 2000s, while the economy was humming along at a fast clip, management continued to make business acquisitions while telling investors just how good of a job they were doing. At the time of publication, the company’s stock had already started to slip into free fall as the global financial crisis hit. The intangible assets that the businesses acquired immediately leading up to the crisis would be written off to the tune of $40 million AUD only a handful of years later. NCAV stands for Net Current Asset Value. It’s an ultra conservative way to measure the liquidation value of the company. It’s also a creation of Benjamin Graham, the father of value investing. By investing in low price NCAV stocks, you’re investing in some of the cheapest stocks on the stock market today and setting yourself up for great profits. Rather than taking all of the company’s assets into account, you only take the firm’s current assets into account when measuring liquidation value. Trading at 87% of NCAV, the company does not offer the same level of safety and profit potential that it did when it was mentioned on our Net Net Hunter Forum. At that point the company was trading for only 58% of NCAV – a massive 42% discount to its bare minimum liquidation value. Investors who got in when it was first mentioned have already made a fat 40% profit in just two months. There’s still life left in the stock though, and the firm’s upside potential is key to understanding the investment opportunity. “Burn Rate” signifies the percentage rate of change in the company’s NCAV. The company has had a rock solid NCAV over the last few years, which is reassuring. The company also has a very solid balance sheet, when looking at the two main traditional financial ratios. Clarius has virtually no debt and a very solid current ratio. The share count has also been more or less steady over the last three years. From 2013 to 2010, in millions: 89.58, 91.616, 91.064, 90.924. The company’s share count jumped from 2009 to 2010 however, as it sold a large block of shares to retire $15 million in debt. From 2009 to 2010 the company’s shares jumped nearly 25 million from 66.014. While that recapitalization diluted existing shareholders, there’s no indication that the company will sell more shares to fund future capital requirements. The company’s massive write-downs of intangible assets during 2013 wiped away a large chunk of its book value. From 2012 to 2013, the firm’s book value tumbled from $78.8 Million to $37 Million. The company now has only $2.5M left in intangible assets, so I don’t expect much in the way of further write-downs. At any rate, even if more intangibles are written down, write-downs do not affect NCAV value. Investors in the USA are all-to-aware of the massive crisis that hit the global economy during 2008/09. Many investors aren’t aware how things look right now, outside their own backyard. While the USA and Canada have both continued to improve economically (growing GDP, shrinking unemployment rate, etc ) during the past 4 or 5 years, Australia has slipped into another major employment crisis. In fact, according to Manpower’s 4Q 2013 survey, Australia is suffering pessimistic business sentiment not seen since the depths of the global financial crisis. Manpower likes to look at hiring expectations to gauge the economic mood and labor market. As you can see, Australia has seen a decline in employment outlook since 2010, with businesses expecting to grow their staff by fewer and fewer people each year. As it stood at the end of 2013, the level of Australian businesses adding new workers was only a little better than 2009. 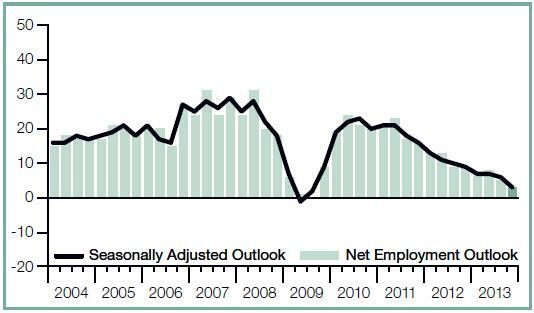 Compare that to the hiring sentiment in the USA. These are troubling statistics, considering that the bulk of Clarius’ offices are located in Australia. While China and New Zealand have better employment situations, Clarius does not have enough offices in those countries to impact business results in a meaningful way. Looks like a winning investment to me! According to the company, this is the worst hiring environment that the company has faced since its inception. Typically, when permanent positions are starting to dry up there is an increase in demand for contract workers, and vice versa. Now, both contract workers and permanent positions are under tremendous pressure. The time to buy cyclical companies is at the point of peak pessimism during a large cyclical downturn. It’s at that this point where a company’s fortune can only increase. Conversely, buying at any other point in the cycle increases the likelihood of loss. So, here is a conservatively financed recruitment company trading below a rock solid NCAV during a period of supernaturally low hiring expectations. While there’s no way to tell at which point the hiring cycle reaches its bottom, if the current environment really is as bad as the company or the Manpower survey says, then investors are protected on the downside. 2008-2009 was an exceptionally bad period for employment in the western world. 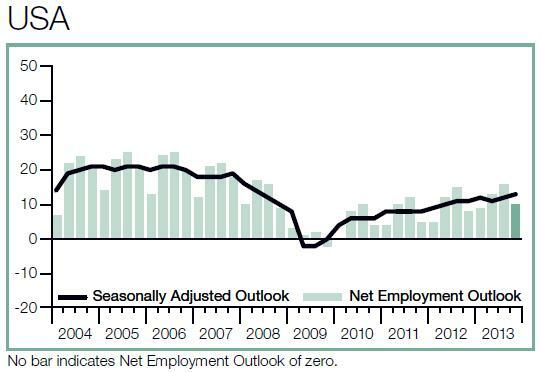 The employment picture hadn’t looked that bleak for years. Now that Australia’s current hiring sentiment has dipped to lows not seen since 2009, there is a far greater likelihood that hiring will revert back to its historic mean rather than decline further. While it’s impossible to tell exactly when the turnaround will happen, mean reversion means increased revenue and improved margins for Clarius. This, ultimately, will increase the company’s profitability, with the share price following suit. What Kind of Upside Do I See? My investment thesis consists of two parts. First, the minimum valuation that investors should be looking at is the company’s NCAV. I consider this a bare minimum valuation for the company since it’s the minimum value investors would receive if the company had to be liquidated. Right now the company has NCAV of $29.29 million AUD. That value has been rock solid over the last few years despite the company’s problems. At the current market cap of $25.53m, investors will see a 14.7% profit before the valuation reaches NCAV. Understandably, that size of capital gain is not exciting. Net Net Hunter members who got in when the stock was mentioned on our community forum will make 60% when the company rises back up to NCAV, and will have taken on less risk in the process. The second part of the investment thesis is where things get exciting. Being a cyclical company, it’s reasonable to assume that the company will revert back to a more typical level of profitability when the hiring market recovers. But the question that has to be asked is what the company is expected to make under normal conditions and how will the company be valued during that period? Ultimately, big money will be made by hanging on to the stock until it reverts back to a more normal, or average, level of profitability. The 14 year period spanned two business cycles, providing enough data for a decent estimate of profitability and valuation. Whenever I look at a growing firm I like to attach profitability to what I call earnings drivers. Earnings drivers are significant assets that the company uses to earn revenue and income. This is very similar to calculating what a company can make using ROA, but avoids the shrinking or expansion of assets that comes with economic cycles. Using an asset that shrinks and expands with the business cycle makes it impossible to estimate what the company could potentially earn with its current collection of assets. For Clarius, I looked at what the company could make based on the number of employment offices the company has. I would assess a retail company in a similar way – though in that case I would be looking at the number of retail locations, not the number of offices. Clarius’ profitability per office shapes like so. What we’re interested in is what this company can make under normal business conditions. Over the last 14 years, the company has experienced some exceptionally bad years for earnings, which understate the company’s average profit potential. This 14 year average is given as $97,000 AUD per office. When we exclude the company’s best and worst 2 years, average profitability over the previous 14 years jumps to $194 000 per office. This is a better measure of average profitability since I consider the company’s recent major loss-producing write-offs to be outlier events. With 38 offices, the company can currently earn $7.37 million AUD under more typical business conditions. This works out to $0.08 per share. Excluding money-losing years, the company’s average PE ratio stands at 14x earnings. When looking at the average PE ratio over the previous 14 years, excluding the impact of money-losing years is important because we’re trying to find what the company could be priced at during an average profitable year. At 14x earnings, the company should be priced at $1.15. Clarius did make as much as $437k per office in 2007. If you want to achieve maximum gain, it’s possible that the company could repeat this performance – but I personally am not counting on it. To me, bettering on an average level of profitability and valuation is much more prudent. If the company can repeat that performance, however, the company could earn as much as $16.6 million AUD, or $0.185 per share. In 2007, the company’s peak cycle PE was roughly 13x earnings, so it’s conceivable that the company could be priced at $2.41 per share. Of course, that’s just speculation. I think the best way to look at this investment is of a stock that’s highly likely to appreciate up to NCAV, a 14% capital gain, and more likely than not to return to an average level of profitability and value at some time in the future. When that happens, at the current price, investors could net a nice 304% capital gain. It won’t be as large as the 475% capital gain that Net Net Hunter members had the opportunity to make but it’s definitely worth making the investment. Investors should note three other key features of this investment that are particularly enticing. The company has an 80% payout ratio and the dividend is fully franked. That means that you don’t have to pay any income tax on the dividend income. The company is starting to expand aggressively into China, which should boost future earnings and help diversify the company’s operations geographically. Management has started to boost the operating efficiency of certain back end business processes by implementing badly needed information technology aids. This is expected to save the company $3.5 million AUD in 2014. Clarius is a spectacular opportunity, but some concerns remain. Will LinkedIn erode the company’s business? Does the company have the ability to earn the same amount that it could earlier last decade? Is the Australian labor market in permanent decline? These are questions that can’t easily be answered which is why buying at such a large margin of safety is key. I’m totally agnostic regarding how each of these plays out. Even with these concerns, at the current price, Clarius is a fantastic opportunity that provides both safety of principle and a chance at major capital appreciation. Best of all, investors have the ability to collect large dividends while they’re waiting for the stock price to appreciate. When all is said and done, this is a great low risk investment that could possibly net you a 300% gain. Hi Evan, I am interested in your service, but I was wondering if you could provide me a copy of one of your reports to see what is offered. Please go to netnethunter.com to check his stuff out. Looks like the company was operating profitably until 07. and it looks like they went through a huge change in how they pay their employees and it ruined the business practice. too hard bin.